It’s time for our company’s annual Chinese New Year dinner and the boss has decided to have it at NUSS Suntec City Guild House this year. 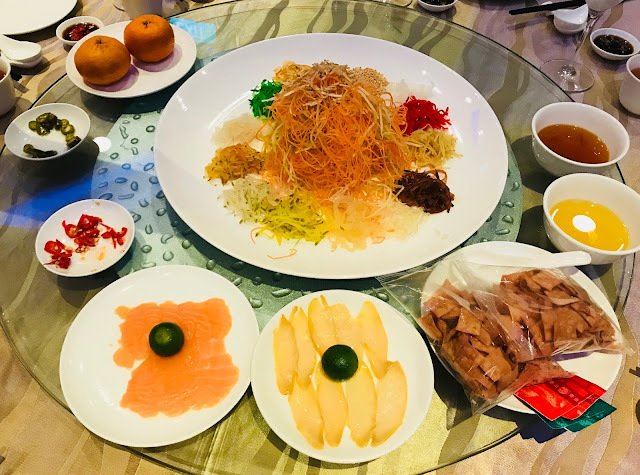 My colleagues and I have dined at NUSS Suntec City Guild House’s The Bistro and we are impressed with the high quality of food served, so we have high expectations of this Chinese New Year meal. Chinese New Year set menu can be enjoyed at both The Bistro and function rooms. A minimum of 2 tables of 10 people is required to book the function room, corkage at $10 per bottle. This year, there are two Chinese New Year Set Menus to choose from, the $698 Prosperity Set and $798 Auspicious Set. The boss chose the $698 Prosperity Set. 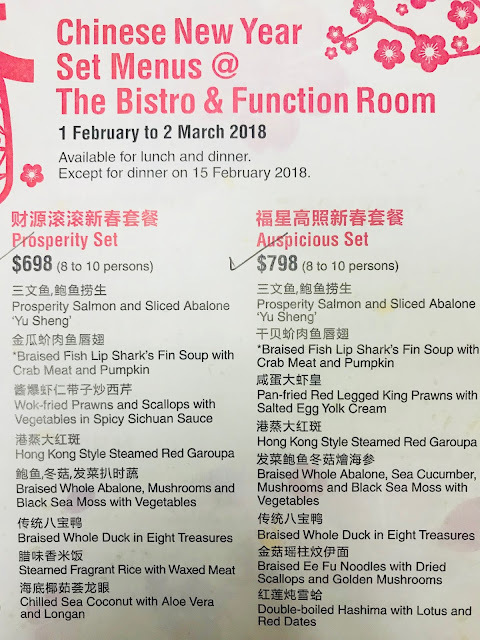 Let me show you the courses in the Prosperity Set and my opinions on each dish. I like that the Prosperity Salmon & Sliced Abalone Yu Sheng is not as sweet as some others that I have eaten. The portion is not too big either, we managed to finish the whole thing. I feel a little cheated by Braised Fish Lip’s Shark Fin Soup with Crabmeat & Pumpkin. I can barely find a few strands of shark fin and crabmeat, just a whole bowl of thickened soup. 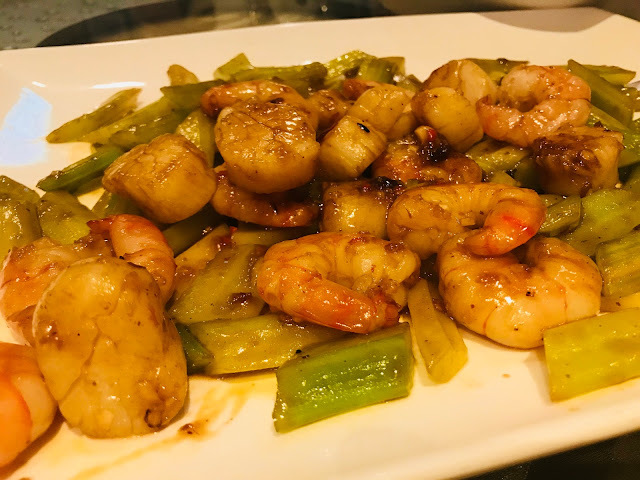 Wok Fried Prawn and Scallop with Vegetables in Spicy Sichuan Sauce is a simple dish made elegant by using prawns and scallops. The prawns and scallops are big and juicy, and the vegetable which happens to be celery is refreshing and crunchy. Steamed Red Garoupa in Hong Kong Style is definitely my favourite dish, and judging from all the “wow” and “yum” that chorused throughout the two tables, I am not alone. This dish is definitely the star of this Chinese New Year dinner. 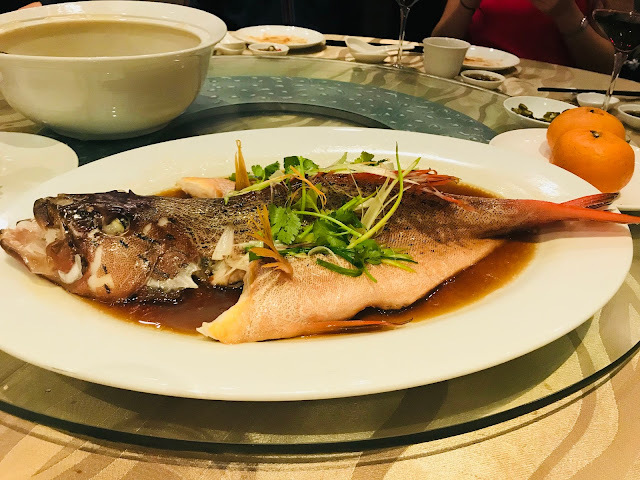 The fish is really fresh, steamed with simple ingredients such as scallions, ginger, cilantro, soy sauce, salt, sugar and oil has brought out the natural sweetness of the red grouper fish. 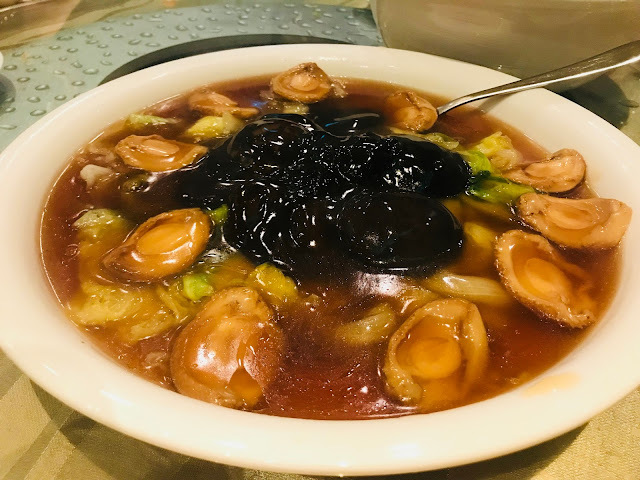 Braised Whole Abalone, Mushroom and Sea Moss with Vegetables is my second favourite dish. 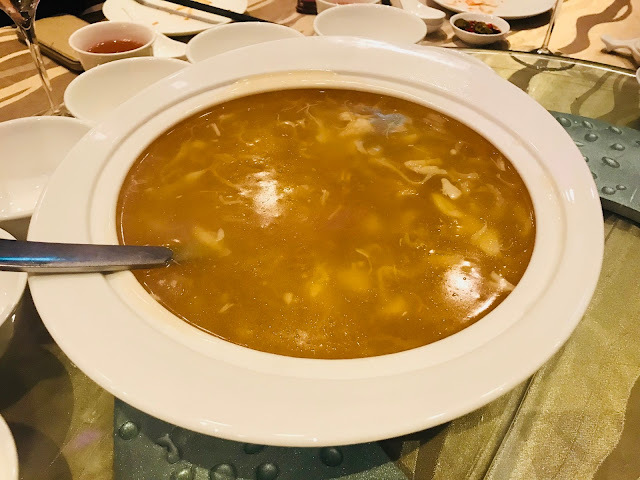 The abalone is juicy and tender, the cabbage is soft and naturally sweet and the mushrooms have absorbed the stock, making it juicy and flavoursome. Braised Whole Duck in Eight Treasures is the Teochew way of cooking duck, by braising the duck in dark soy sauce. 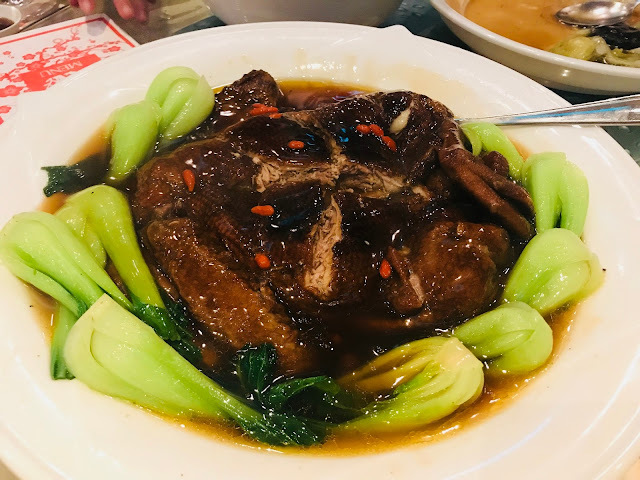 The duck looks brownish but it is not overly salty and the steamed bak choy that surrounds the dish helps to bring some balance into the dish. Steamed Fragrant Rice with Wax Meat in Lotus Leaf, which is also known as Lap Mei Fun in Cantonese, is a traditional Chinese New Year dish that is pretty simple to prepare. 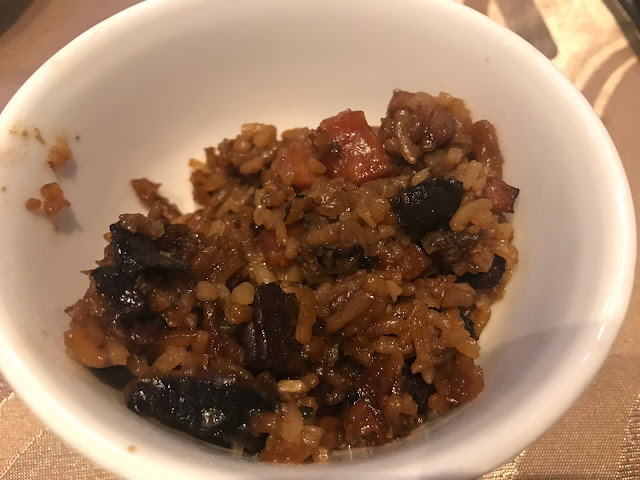 Made with only rice and waxed meat, this dish can be made even tastier by adding Chinese mushrooms. Ending the meal with a bowl of Chilled Sea Coconut with Aloe Vera & Logan. 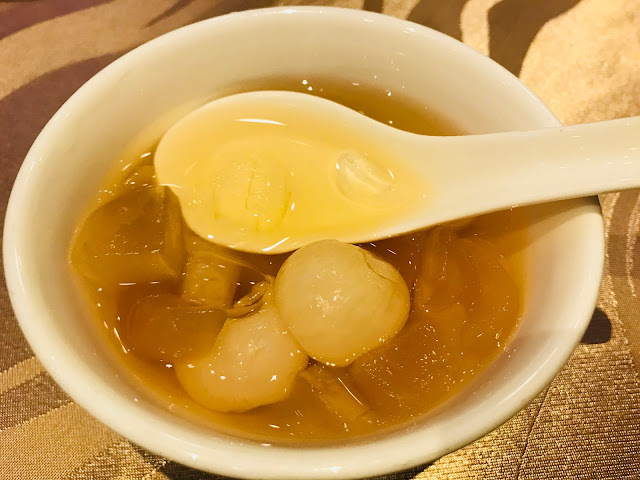 The difference between the $698 Prosperity Set and the $798 Auspicious Set is an additional Braised Ee Fu Noodles with Dried Scallops and Golden Mushrooms and the dessert is Double-Boiled Hashima with Lotus and Red Dates. 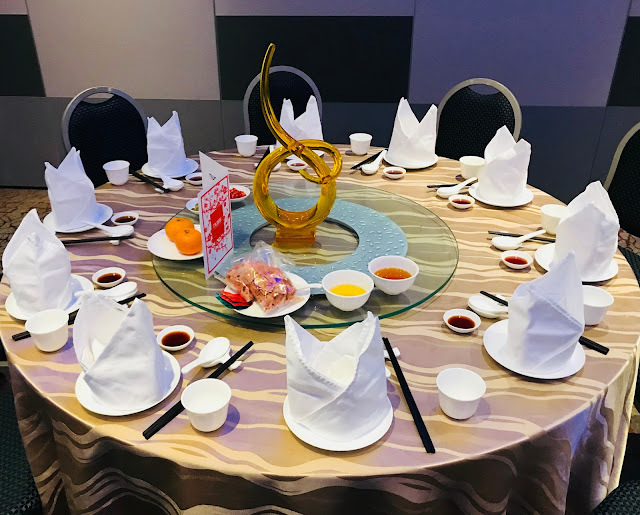 I know that by the time you read this post, the 15 days of Chinese New Year have just passed, but I hope to give you another venue to consider for next year’s company Chinese New Year dinner. If you want to book the function rooms, please look for Prabavathy by emailing her at prabavathy@nuss.org.sg.